“We knew that not everybody was a migrant in search of a better life. It does prove us right and we will most likely find a lot more. I just wish we’d had it sooner.” That was the quote from a Border Patrol spokeswoman to the Arizona Star yesterday when she was asked about the Integrated Automated Fingerprint Identification System in use now for over a year. The system has identified 3 child molesters in just the last week and has led to authorities re-capturing 8,283 criminals who had previously served time in our jails and were deported--only to return to prey on U.S. citizens again...and again. Last year the Department of Homeland Security reports there were 50,720 criminal deportations of foreigners (OTM’s) nationwide and another 60,996 deportations to Mexico. There is only one solution: bring our National Guard troops home and station them on the border with Mexico. When will enough be enough? When will the sheeple get the idea that having 3,000 law enforcement and Homeland Security troops to protect a bunch of pandering subversives at the Democratic and Republican conventions is absurd? Why aren’t those 3,000 troops put on the border to stop criminals and terrorists from breaking into our country? We would not have this problem if the federal government had done its job in the first place. Now do you know why Tom Ridge and John Ashcroft tell us every day that we will be attacked…and there’s nothing they can do about it! Madness! A local Arizona television news crew was on the border last Saturday to look at the illegal alien problem.� The theme of the article that they are working on is the middle easterners sneaking into the country through Mexico.� After touring a ranch near the border, the crew went to the south end of the Mule Mountains about mid-afternoon.� After about an hour wait, they watched as 125 illegal alien invaders crossed the border and headed north at breakneck speed right in front of the crew and citizen volunteers. Three calls were made to the Naco Border Patrol station.� They were informed that a news crew was on the scene documenting the event.� It took our Homeland Security forces over two-and-a-half hours to respond. All 125 illegal aliens were well into the hills by the time Homeland Security arrived. that citizen patrol groups are seeing, it’s hard to believe that is true. All of the following information has been verified. Why are the major radio and television networks not covering this story every hour on the hour every day? Each day that passes without Congress and the President putting our troops on the border is another day the United States federal government considers you, the citizen, an expendable item. Buy lots of ammo and keep your powder dry and your weapons well oiled. Congressman John Culverson just stated he has just received information from Southern District U.S. Attorney Michael Shelby (Texas) that Al Quaeda members have been entering from our southern border and have been entering through Texas and blending into towns. The congressman stated this was once classified and he has now been given the OK to release this information. New York-WABC, June 16, 2004) — The FBI has arrested an American citizen living in Queens said to be a sleeper agent for Al Qaeda. ABC News reports investigators have tied the man to a terrorist cell set to carry out a series of bombings and assassinations in London. The man, a naturalized citizen from Pakistan, was secretly taken into custody in April. He is being held at the Metropolitan Correctional Center in Lower Manhattan and is said to be cooperating, offering investigators significant information about Al Qaeda’s plans. He is being held as a material witness and his family is now under federal protection. The suspect’s assertions were part of the intelligence that led to recent warnings about a summer threat from Al Qaeda. While the U.S. government wages war against terrorism on foreign soil, America’s poorly guarded Mexican border continues to be used as a covert entry portal by international gangs that smuggle Arabs into the U.S. In November last year, Mexico’s consul in Lebanon, Imelda Ortiz Abdala, was arrested on charges that she helped a smuggling ring move Arabs illegally into the U.S. from Mexico. Also arrested in connection with the smuggling operation was Salim Boughader Mucharrafille, who ran a Lebanese café in Tijuana, Mexico. U.S. security officials say Boughader, 28, is suspected of smuggling at least 300 Arabs into the U.S. between 1999 and 2002. He had been arrested previously for smuggling and served 10 months of a one-year sentence. Although the latest case has not received wide publicity, U.S. officials are worried because the case reaches into Mexico’s foreign service, which the U.S. depends on for help in security operations against terrorism. The Chicago Tribune reported last month that discovery of the smuggling of Arabs by Mexicans “set off alarm bells among U.S. security officials.” That’s because the arrests undercut assurances by pro-immigration groups that it would be difficult for Islamic radicals to slip through the border because they would stand out and Hispanic smugglers might hesitate to assist them. Security officials note that café owner Boughader, who has pled guilty in one smuggling incident, easily turned his illegal alien clients over to Mexican smugglers who asked no questions about the background or motives of the people they were helping across the border. The Tribune reported that Abdala, the Mexican consulate officer in Beirut and 25-year veteran of Mexico’s foreign service, allegedly charged as much as $4,500 for fake visas for Arab clients during her tenure there from 1998 to 2001. As a result of the corruption in Mexico’s foreign service, American officials say there is no way to tell how many Arabs, perhaps some with terrorist connections, have been smuggled into the U.S. through Mexican channels. Investigators looking into the Boughader case say most of those he is suspected of smuggling were Muslims, and some were Christians from Lebanon. So far, authorities have found no connection to terrorist groups among the suspected clients, but according to the Tribune, “U.S. agents detected some support for Islamic fundamentalist groups, such as Hezbollah.” The militant Lebanese group was blamed for the murderous bomb attack on U.S. Marines in Beirut in the 1980’s. Islamic terrorists have in the past come into the U.S. through programs designed to help Mexicans. Mahmud Abouhalima, a leader of the 1993 Trade Center bombing, was legalized as a “seasonal agricultural worker” as part of the 1986 amnesty that Congress granted to illegal aliens. A shocked and concerned family from Cincinnatti, Ohio, asked a Tombstone Deputy Marshal about all the commotion last Saturday afternoon, as the man along with his wife and teenage son were visiting the famous Boothill Cemetary. The commotion might just seem an everyday occurence to residents of Tombstone, but to the many tourists who witnessed the event it was a wake up call. The family of tourists from the Midwest said they had noticed an increase of suspected illegals in their community but were concerned about what they saw and learned about the increasing dangers associated with human smugglers and their disregard for the safety of everyone involved. ram a patrol car driven by officer Vance Rodel. After being blocked by another officer, the driver stopped the vehicle and fled on foot across Highway 80. The young male driver, wearing a tan t-shirt, escaped apprehension. Eleven other illegal aliens were not so lucky as they were chased through the neighborhood and apprehended by officers a short time later. Cochise County Sheriff Larry Dever assisted in rounding up the group of 7 men and 4 women who were crammed into the pickup that had been reported stolen from a Tucson construction company just the day before. 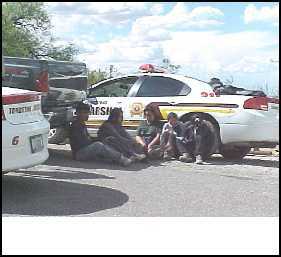 The illegals were turned over to Border Patrol and the truck was impounded by the Cochise County Sheriff’s department. No officers or bystanders were injured in the chase. On July 15, 2004, I made my weekly trip from Hereford to Sierra Vista to do my banking and shopping. On my belt I wore my usual .38 special revolver in an open carry holster. With a deposit slip and a check in my hand, I exited my vehicle at the Compass Bank parking lot at 211 Carmichael Street in Sierra Vista around 10:30 a.m. Noticing a Cochise County Sheriff’s Department SUV in the lot, I proceeded to the bank, and as I passed 2 deputies chatting outside the entrance, I courteously said “Good Morning!” to them and entered the bank. Again the deputies insisted that I couldn’t carry on federal property. “This isn’t federal property,” I said. “It’s private property.” Seeing that I wasn’t going to win this argument, and being told to leave the bank with my self-defense weapon, I exited, stowed my gun in my car, and returned to do my banking. While I was never threatened with arrest, the deputies, who were twice my size, were very intimidating, and insistent upon getting their way. Rather than stand my ground, and possibly risk arrest, I allowed them to bully me into submission, even though I thought I was correct in the law. I’ve carried my gun into banks before and never once been challenged, or threatened by law enforcement. I was scared, I admit. Had I not been upset, I might have had the presence of mind to take their badge numbers, so that I could get them into some real trouble, or demand to speak to their supervisor. I did, however, call the Sheriff’s department, and spoke to Commander Rod Rothrock, who said he didn’t see any state law against carrying in a bank, and that he would look into the incident and call me back. This is how the sheep get sheared. I am certainly not a member of the sheeple, yet two huge law officers were enough to intimidate a 50-something woman legally carrying a defensive weapon. They had no right to intimidate and harass me. I wasn’t doing anything wrong, and I certainly don’t look scary. Maybe they didn’t like my clothing, or was it because I looked too much like one of their grandmothers? They had me confused about the law, because they were so insistent that I was wrong and they were right. It’s time for those boys to go back to school and take a refresher course on what laws apply to open carry. Through their intimidation and bullying, I was stripped of my second amendment rights and left defenseless. I’m left wondering if I should have attempted some intimidation of my own by getting their names and badge numbers, and telling them I’m a reporter for the Tombstone Tumbleweed. The following day I spoke to Linda Pugh, Manager of Compass Bank. She said she talked to Compass Bank’s security department, who said it was CORPORATE policy to NOT ALLOW guns in their banks, and that applies to all 6 states in which Compass does business. Then I said, “But State law requires that you post a sign, saying “NO WEAPONS,” and she responded, “Our legal department says we don’t have to post.” Then I asked her if she knew the two officers there that day. I know she did, because she said that banking privacy laws restrain her from telling me the identities of Compass Bank’s customers, and she had to refer me to her legal department! “But I don’t care if they are customers,” I said. I just wanted to know who was giving me incorrect information! I told her I thought the sheriff’s department owed both of us a letter of apology, as it was not my intention to become part of a scene at the bank that day. It seemed to me that Compass Bank thought its corporate policy superseded state law. I then talked to Todd Velaber, Regional Security Manager (480-961-8427), who said, repeating the corporate mantra, that the bank doesn’t have to put up a sign that says “No Weapons.” I told him again that state law says it must be posted, and he didn’t believe me. I also pointed out to him that for the sake of public relations, it would be advisable to POST A SIGN, so there would be no further incidents, instead of requiring the bank manager to inform every gun-carrying, law-abiding citizen-customer, that their gun is not welcome at that branch! I received a call from Commander Rothrock of Cochise County Sheriff’s Department, and he said he found out who the officers were, and that they had been corrected by their Lieutenant. They were wrong about the law. I asked him to send me a letter of apology, and he said he would. I also asked him to call Todd Velaber and let him know that Arizona State law says if a business doesn’t want anyone to carry inside, it must be posted, although Commander Rothrock says that there is no penalty for not posting! All of this occurred within a day of the incident. Although I do not appreciate being harassed for exercising my Second Amendment rights, I am very impressed with the responsiveness of the Cochise County Sheriff’s Department to a citizen’s concerns about the dissemination of incorrect information about the law. ...then they asked if we had any sandwiches. We told them to ask for Jennifer Allen or Robin Hoover when they get to the Border Patrol station. Five of the eleven illegals caught attempting to evade capture by authorities sit while county sheriffs and Tombstone Deputy Marshals round up the rest that ran through the neighborhoods of the Boothill Subdivision Saturday afternoon. The Ford F250 pickup was reported stolen from a Tucson construction company Friday; it was being used to smuggle human cargo less than 24 hours later.